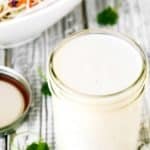 This Buttermilk Salad Dressing is quick, simple, creamy and epically delicious!! Perfect to dress coleslaw, mixed greens, cold pasta salads, steamed broccoli or asparagus spears, as a dip for crunchy vegetables, chips, or sweet potato fries. So much better than any store-bought dressing. Combine all of the ingredients in a medium bowl and whisk until well combined. Taste and adjust seasoning if necessary. If consistency is too thick, thin out dressing with a splash of additional buttermilk. Use eggless mayo if you are egg intolerant or allergic. Blue Cheese: Add 2 ounces crumbled blue cheese. Greek: Add 2 ounces crumbled feta cheese and 1 tablespoon chopped dill. Spicy: Add a tablespoon of hot sauce and/or use cayenne pepper instead of black pepper. Caesar: Add 2 minced garlic cloves and minced anchovy fillets. If you are looking more salad dressing recipe check out my Raspberry Vinaigrette and Maple Vinaigrette.